Libya’s prime minister has demanded that all armed militias leave Tripoli "without exception," after clashes between militiamen and armed residents left dozens dead and almost 400 wounded. At least 43 people were reportedly killed in Friday’s street fighting, one of the worst in the Libyan capital since the overthrow of former leader, Muammar Gaddafi. The Libyan Justice Minister declared three days of mourning following the bloodshed, according to the country’s state news agency LANA. "The existence of weapons outside the army and police is dangerous," Libyan Prime Minister Ali Zeidan said in a speech delivered shortly after the clashes. "All armed militias need to leave Tripoli, without exception." 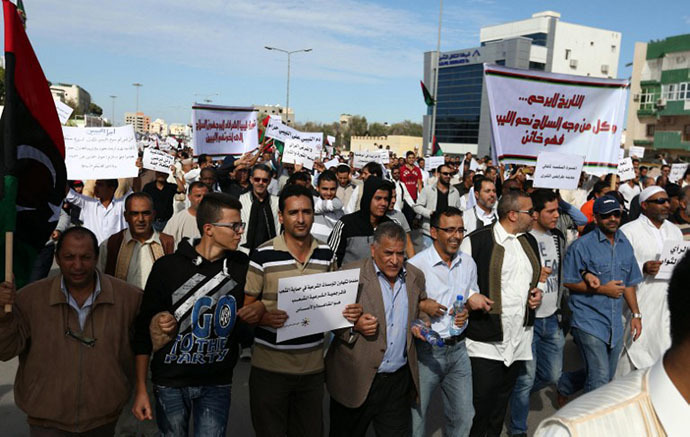 "The demonstration was peaceful and had been permitted by the interior ministry, and then the protesters were fired on when they entered the Gharghur district" where the militia's headquarters are located, Prime Minister Ali Zeidan said in an exclusive interview with Reuters TV and the Libyan television channel Ahrar. At least 32 people were killed and 391 wounded, a Health Ministry official said. Libyan Defense Minister Abdullah Al-Thani cut short his visit to Jordan and is returning to his home country, LANA reported. 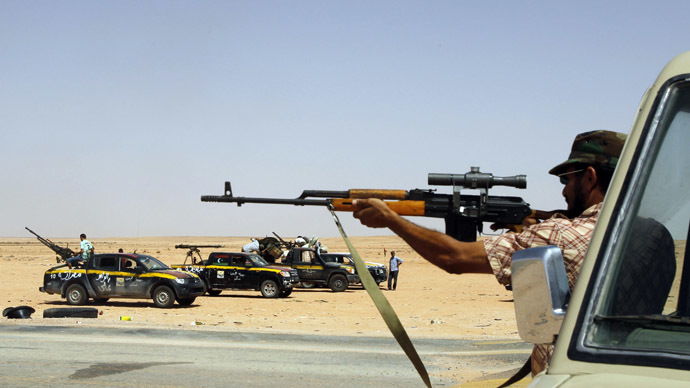 The Misrata militia reportedly opened fire with heavy machine guns and rocket-propelled grenades at protesters as they approached its headquarters in the Gharghour district. Thousands of protesters gathered in the Libyan capital, calling to intensify the security presence and end the militias’ rule established in 2011, after the uprising that ousted leader Muammar Gaddafi. The protesters marched from a downtown mosque to the headquarters of the militia waving Libyan flags and chanting slogans such as "We want an army, we want police." According to a Reuters report, the militia fired an anti-aircraft cannon into the crowd, after which the protesters first fled but then returned heavily armed. The report added that the demonstrators stormed the gated building, and kept the militiamen there until nightfall. According to reports, the HQ was torched and other buildings in the district belonging to the Misrata militia were raided by demonstrators. The Libyan Defense Ministry has ordered the country's armed forces and the police to intervene immediately to restore order. Dozens of trucks reportedly arrived with backup, sealing off roads in an attempt to end the clashes. The rally was sparked by a string of recent street clashes in which the militia from the city of Misrata, which has a heavy presence in the capital, also played a central role. 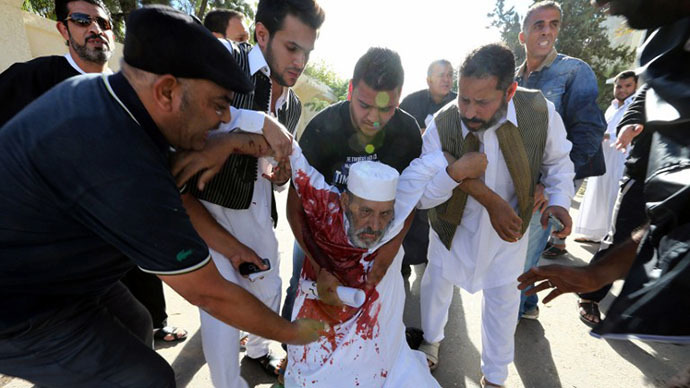 The violence was also triggered by the killing of one of the Misrata group's commanders. Part of the militia was formed from local brigades of rebels including Islamic militants who fought against Gaddafi’s government. After the fall of the leader, the government tasked the former rebel forces with maintaining security. However, the militia has not been put under state control, prompting the armed groups to act on their own agenda. Conditions for another NATO intervention? Currently, there is no one in Libya who can play the central military role, defense consultant Moeen Raoof explained in an interview with RT. He describes militias as having no aim but to gain power. “They are trying to take over Tripoli because it is the capital. But, none of them seem to be succeeding, which is setting the conditions for another NATO intervention, like Iraq and Afghanistan,” he said. “Western states saw this coming and they knew that there would be chaos in the country,” which would set up perfect conditions for a NATO intervention.